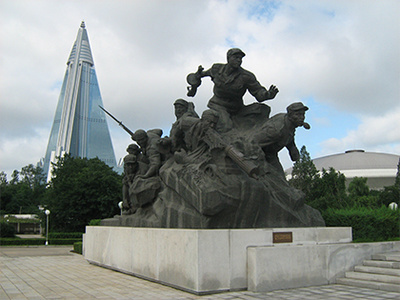 Sunday 9 September was the 70th anniversary of the creation of North Korea. As has been usual in recent years there was a very highly-structured ceremonial parade. Such mass events are used to convey policy priorities to its citizens and to the outside world. This year, the parade was less aggressively military than in the past and might be interpreted as placing an emphasis on socio-economic development. It is never easy from the outside to decipher North Koran symbolism. It may even be difficult for North Korean citizens to understand the message. There will be later in September another summit meeting with the President of South Korea and we may see more clearer then if advances in tension reduction can be made. possibility of small steps that build confidence between the two Korean States and that do not overly worry the USA and China who watch events closely and who may do more than watch. It is unlikely that any progress will be made in the foreseeable future concerning demilitarization of the Korean Peninsula or unification. Small steps are probably the 'order of the day'. However, Track II - informal discussions which are not negotiations but a clarification of possible common interests and areas of joint action - can be helpful. Track II efforts have not been on a scale to quell tensions over North Korea's nuclear weapons and missile advances, and the saber rattling of governments has done nothing to reduce tensions. "Fire and fury like the world has never seen" is probably not the vocabulary that leads to negotiations. It is hard to know how seriously to take the saber rattling, but the sound is loud enough and the sabers are sharp enough that calmer spirits need to propose confidence-building measures. The Association of World Citizens had proposed to the then Secretary-General of the United Nations, Ban Ki-Moon to have a U.N.-led conference to transform the Korean War Armistice of 1953 into a Korean Peace Treaty. Such a Peace Treaty would confirm the international legitimacy of the two Korean States while not preventing at a later date a con-federation or other form of re-unification. Such a conference and Peace Treaty could play an important role in reducing regional tensions. However, such a conference would require a good deal of negotiations as all conditions would have to be agreed upon in advance. Diplomatic conferences "bless" efforts made before in private. A successful diplomatic conference rarely starts from zero. Another avenue of confidence-building measures is what the University of Illinois psychology professor Charles Osgood called GRIT - Graduated Reciprocation in Tension Reduction. He recommended an incremental series of conciliatory unilateral initiatives. They should be varied in nature, announced ahead of time without bargaining and continued only in response to comparable actions from the other party - a sort of "arms race in reverse". Unilateral initiatives should, whenever possible, take advantage of mutual self-interest, mutual self-restraints and opportunities for cooperative enterprise. GRIT efforts were carried out concerning Korea in the early 1990s between Presidents of the USA and North Korea but rarely since. Currently, the governments of Russia and China have proposed a GRIT-type proposal of a "double freeze" - a temporary freeze on North Korea's nuclear and missile tests in return for a sharp reduction of US military presence in South Korea. A "double freeze" may be too large a shift at this stage. The Association of World Citizens has proposed such steps as increased family contacts, cultural exchanges, increased food aid to the Democratic People's Republic, a lessening of economic sanctions and an increase in trade. There is a need to halt the automatic reaction to every provocation, and to "test the waters" for a reduction of tensions. Real negotiations may take some time to put into place, but GRIT-type unilateral measures are a possibility worth trying.